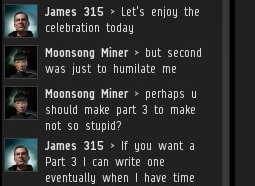 In the midst of the celebratory bumper fleet and surprise announcement of my CSM candidacy, I received a private convo request. Let it never be said that I do not pay attention to my constituents. 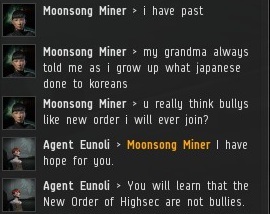 As the future representative of highsec, listening to the miners' concerns is part of my job. 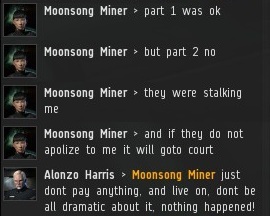 Moonsong Miner's concerns were not very clear to me at first. Part 2? Stalking? Someone from Afghanistan? Moonsong explained that she was okay with Part 1 of the "Mad Moon Rising" series, but was offended by Part 2. Personally I thought they were of comparable quality, but everyone's a critic these days. Moonsong requested I write a third part of the series. In the hopes of getting her vote(s) for CSM, I decided to comply. Prior to my arrival for the bumper fleet, Moonsong was in Brapelille telling everyone who would listen about her rekindled hatred of the New Order. Brapelille was packed, so she had an unusually large audience. 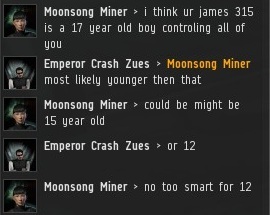 Rebel Emperor Crash Zues fell into the Miner Bingo trap of calling me a 12 year-old, but Moonsong insisted on a 15-17 range. Moonsong was in rare form. She had just finished reading Part 2, though she didn't explain why it was so much worse than Part 1. She also had a complaint to lodge against Agent Alana Charen-Teng, who had bumped her while she was still in Deninard. 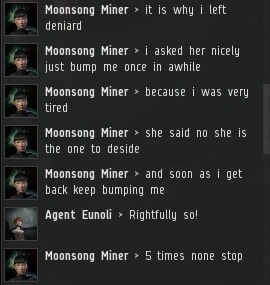 Moonsong made the faulty assumption so many others make--she assumed the miner gets to decide when the bumper gets to bump. Not so! Agents have total discretion. Agent Agent Eunoli extended another invitation for Moonsong to join the New Order, but we remind her too much of the Imperial Japanese Army. 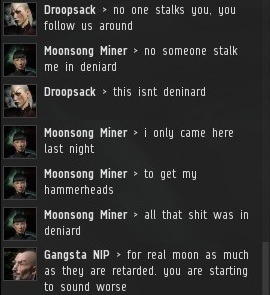 Many in Brapelille put the blame on Moonsong. If she appeared foolish in the screenshots, it was because of things she chose to say. 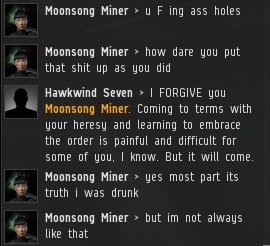 Moonsong conceded that she had been drunk, but felt balance was lacking since there weren't screenshots showing her when she was sober. She vowed revenge. Just as the attack on Pearl Harbor was avenged, so too would be that particular blog post. Moonsong began to offer details on her confusing remarks about her son. Evidently he was the first to read Part 2, and he called her about it. It seems MinerBumping is popular among active-duty soldiers in Afghanistan. Imagine what we could accomplish if the U.S. military were to be fully absorbed into the New Order? Moonsong's main complaint about Part 2 was that it consisted of screenshots taken while she was in Deninard. New Order Agents in Brapelille and Chelien local are fine, but Deninard? That stuff's supposed to be private. This time, Moonsong meant business. If necessary, she would go to the state prosecutor and send us all up on charges of stalking and "destroying personal ability". Serious charges. But did she have any evidence? This was quickly becoming a family affair, as Moonsong enlisted her daughter's aid. I can't help but wonder how a prosecutor would react if he were handed a print-out of "Mad Moon Rising, Part 2". Not all prosecutors are familiar with space law, after all. They might need to call in a specialist. Upon reflection, it wasn't me who was to blame. Moonsong was pretty sure I was not the one stalking her in Deninard. But whoever was responsible would end up in her crosshairs. 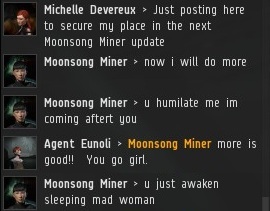 Public opinion in Brapelille, even among the rebels, slowly turned against Moonsong Miner. Before long, I arrived in system to bump some miners and deliver the announcement of my CSM candidacy. Moonsong convoed me to make her request. 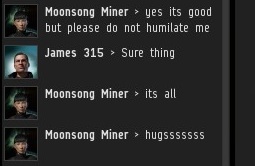 I intend to convince every miner in highsec that I will work just as hard for all of them as I have for Moonsong. I like Moonsong Miner, I think she's fun...I hope she will eventually join the New Order, she would be a great addition. Moonsong, don't be angry, I bet I'm not the only one who likes you. This is no humiliation, you're famous now...and if you change your mind and join the New Order you will be even more famous and liked. The New Order is fighting for a better high sec, stop being a rebel and get in the family...life in high sec is a lot happier under the benevolent wing of James 315. No joke, he's not a bully, he's a Saviour, and I'm sure that you'll find out by yourself if you join. He's not your real enemy. 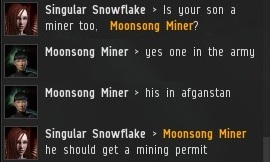 AFK miners are. Come on! I think there should be a fine for poor grammar. Nearly all of Moonsong's posts made my brain hurt. TBH considering that Moonsongs' first language is probably not English, his/her grammar is miles ahead of some of the native English speakers. while i find his attempts quite funny, and do serve a purpose... the NO is bound to fail at this point. lack of screening at this point has poven this point. NO folks have been trolling for cash in my sec inthe citidal... not a good sign. At this point I think we can point out that the point of the New Orders success points towards the point of sticking to the Code of Conduct. After all, the point of that is the point. I don't think you understood the point he was pointing out. The point of the whole thing is that the points the NO is pointing at are pointing towards a different point than what most people would think it points at. Anyways, i certainly disagree with aforementioned point, as well as the point and the point. When all is said and done though, points will be points. You're pretty much provoking her. She went to Brapelille because of the celebration. She's the one following the New Order around. 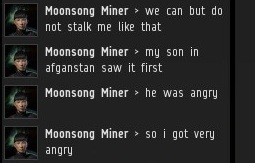 God help all the Korean mothers with sons and daughters in Afghanistan who simply want to AFK-mine in EVE. I believe New Order should seriously consider adopting her as the official team mascot of the New Order. She tirelessly appears in local every day providing entertainment and free advertising for NO. This thread is like watching the village punk beat up a crazy homeless woman collecting tin cans behind the local mini-mart. No, this is like the crazy homeless woman collecting tin cans keeps following the kind and gentle people of the New Order to harass them with insane rants. 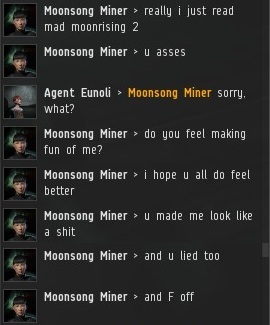 very eye opening to see the self entitled, raging, profanity spewing miners. they deserve everything you do to them. Please please do not suicide gank Moonsong miner. She may be a code violating rebel but she is clearly awesome nonetheless.